Small living room layouts are no reason to not show off your design style. Here, we share more than 20 of our favorite small living room designs that will inspire you to be more strategic with your decor choices. In a Marfa, Texas, home, a living room with a layered aesthetic includes a Poul Henningsen light fixture, a Navajo rug, and a cabinet by Robert "Mouseman" Thompson that holds an Ansel Adams photograph. The walls are painted in Benjamin Moore's Cloud White. The love seat in the living room of a cozy Montana guesthouse is by Cisco Home. The cabinet is 19th-century Moorish and the cocktail table is a custom design. 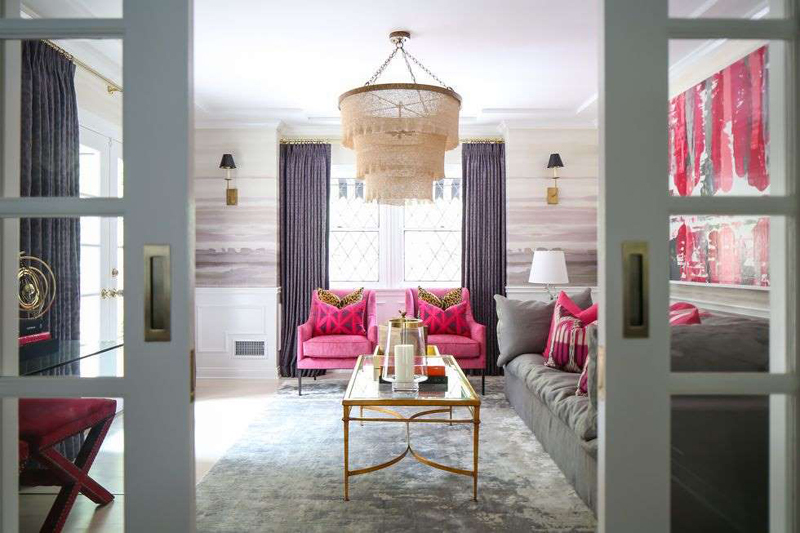 Oly footstools, an antique crystal chandelier and a wallcovering from Sloan Miyasato complete the space. A buffalo-hide rug is layered on top of a Mark Nelson Designs carpet. Antique pieces from the 20s, 30s and 50s, including Dorothy Draper chairs, are one of the main highlights of the living room in the Beverly Hills home of Too Faced Founders Jerrod Blandino and Jeremy Johnson. The Slim Aarons photo hanging in the kitchen are juxtaposed against modern touches like Kate Spade sconces along the stairs and a brass-and-marble dining table designed by Jerrod himself. In a Netherlands living room, off-white sofas pop against a dark background, adding to its cozy, romantic vibe. 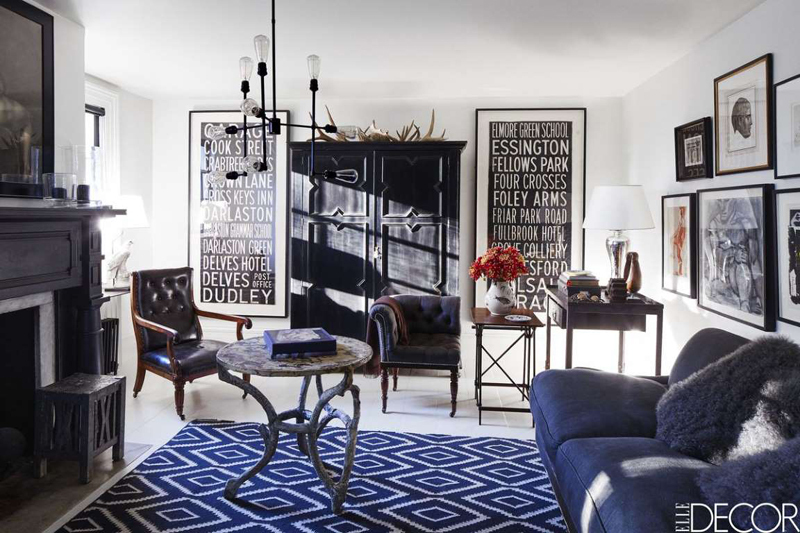 In the living room of Kate and Rem Reynolds’s townhouse in Windsor Terrace, Brooklyn, the sofa from ABC Carpet & Home is upholstered in a fabric by Soraya Shah for Studio Four NYC, the design showroom Kate Reynolds co-owns. 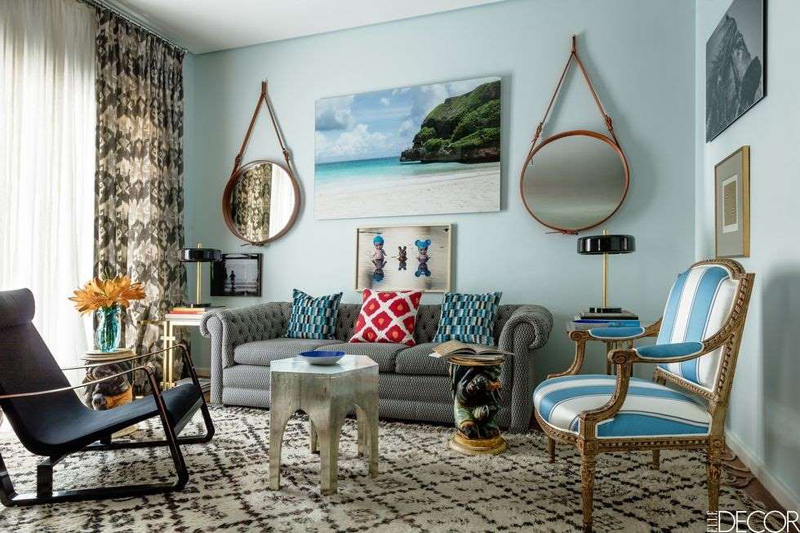 The room is outfitted with a Timothy Oulton chaise, a Danish cocktail table, an Akari pendant light by Noguchi, shades of a Rebecca Atwood fabric, and a vintage Moroccan rug. The walls are painted in Benjamin Moore’s Huntington White and the trim in Iron Mountain, the photograph is by Claire Nitze, and the cameo portrait is by Doug Meyer. 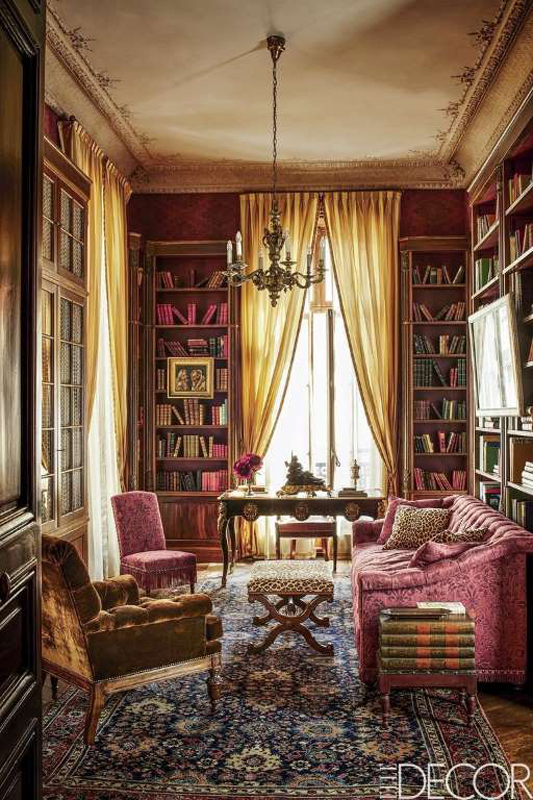 In the sitting area of a Parisian apartment, the sofa is upholstered in a cotton damask, the armchair is covered in a silk velvet and the slipper chair is based on a Mongiardino design; the desk is Louis XV, the chandelier is Louis XIV and the 19th-century rug is Persian. 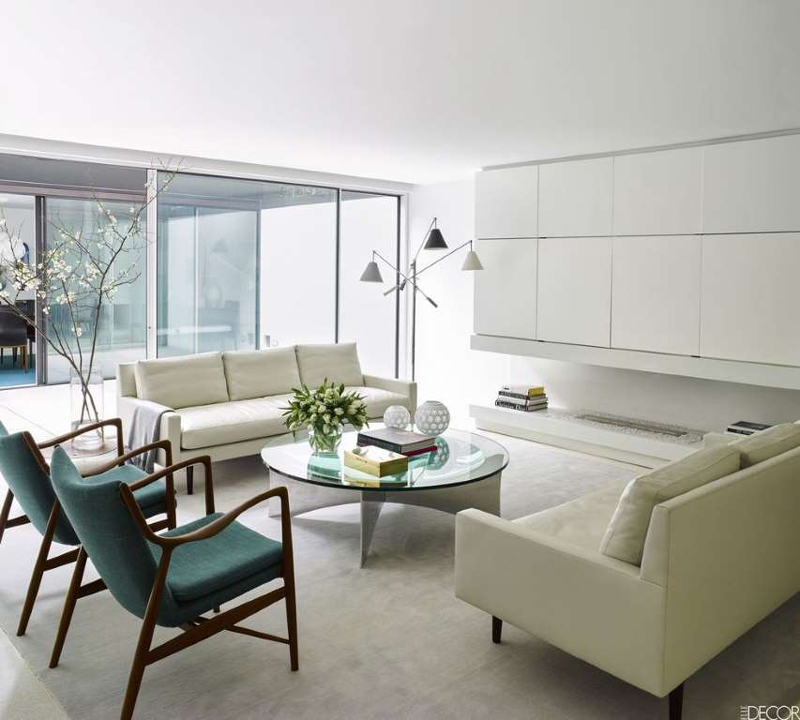 In the living room of fashion designer Erin Beatty and filmmaker Lex Sidon’s West Village duplex, which was designed by Lara Apponyi and Michael Woodcock of Work + Sea, the leather sofa is by Michael Felix, the love seat is by Pinch, and the Marcel Breuer chairs are from Knoll; the marble cocktail table is a custom design, the stool by Reinaldo Sanguino is from the Future Perfect, the floor lamp is by Noir, the rug is by Aelfie, and the paintings are by Jimmy Lee Sudduth, left, and Willie Jinks. 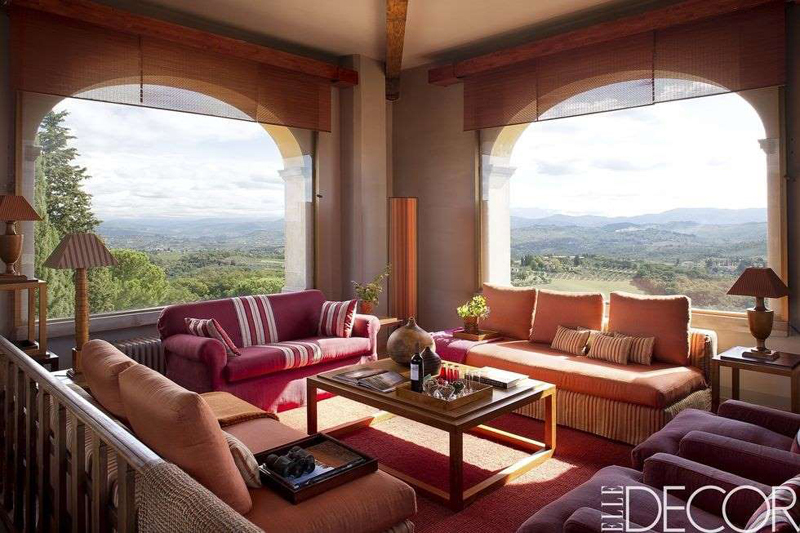 At the top of the tower of a Florence manor, with 360-degree views of the Apennine Mountains, a living room contains a vintage sofa and custom daybeds covered in fabrics by C&C Milano. The motorized shades are bamboo, and the cocktail and side tables are Miani designs. 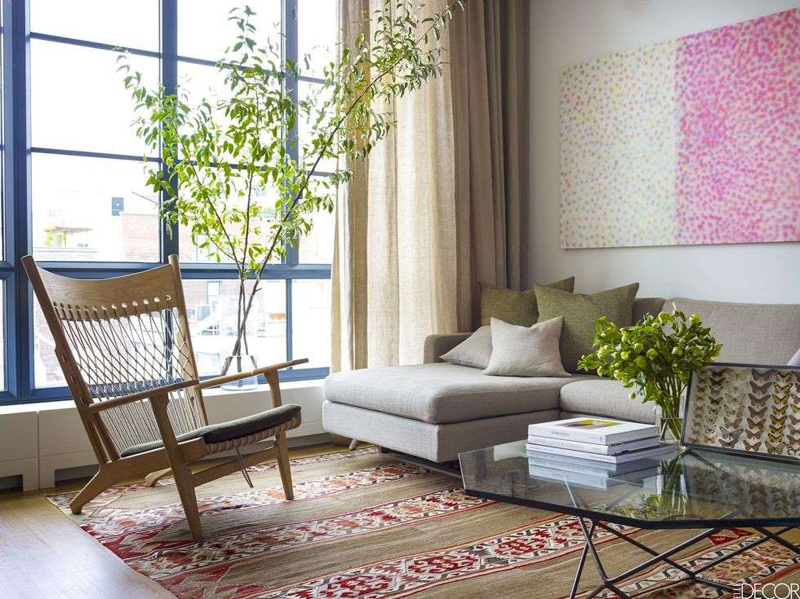 In a San Francisco loft, the sofa inspired by Donald Judd has cushions covered in a Schumacher linen, the steel cocktail and side tables are custom designs, the vintage floor lamp is Danish, the paintings, from left, are by Howard Hodgkin and Conrad Marca-Relli. 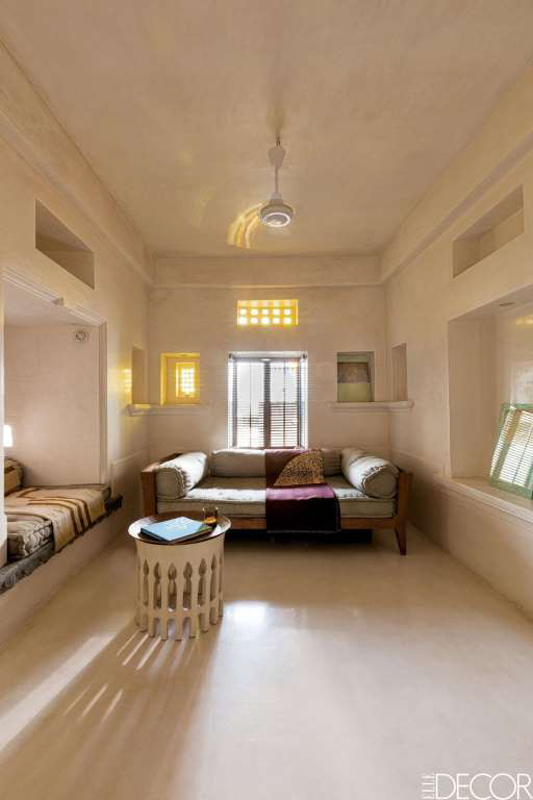 In designer Paul Mathieu's Udaipur townhouse, the sitting room's settee and side table are both by the designer; the shutters are rosewood. 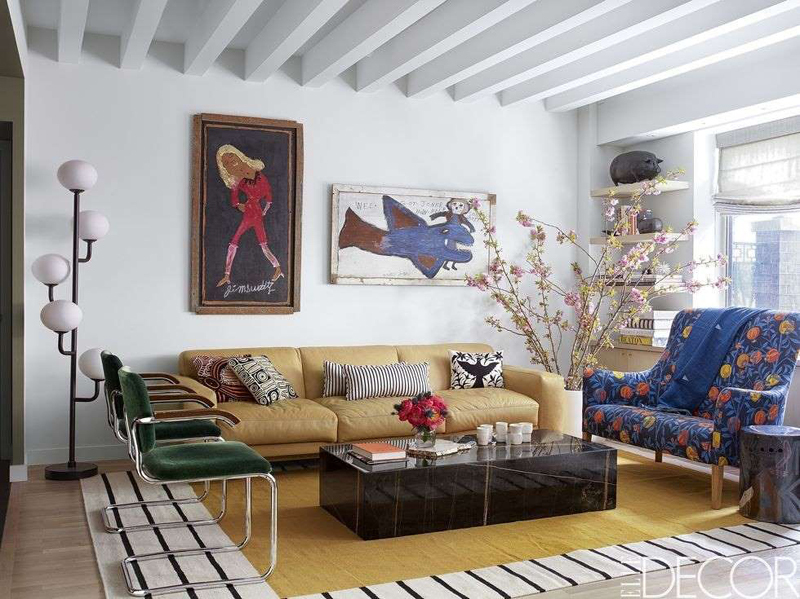 In this West Village loft, the den's custom sofa is based on a 1960s Harvey Probber design and covered in a Ralph Lauren silk velvet; the 1970 French cocktail table is by Michel Boyer, the nesting tables are based on a Poul Kjaerholm design, and the artwork is by Marilyn Minter. 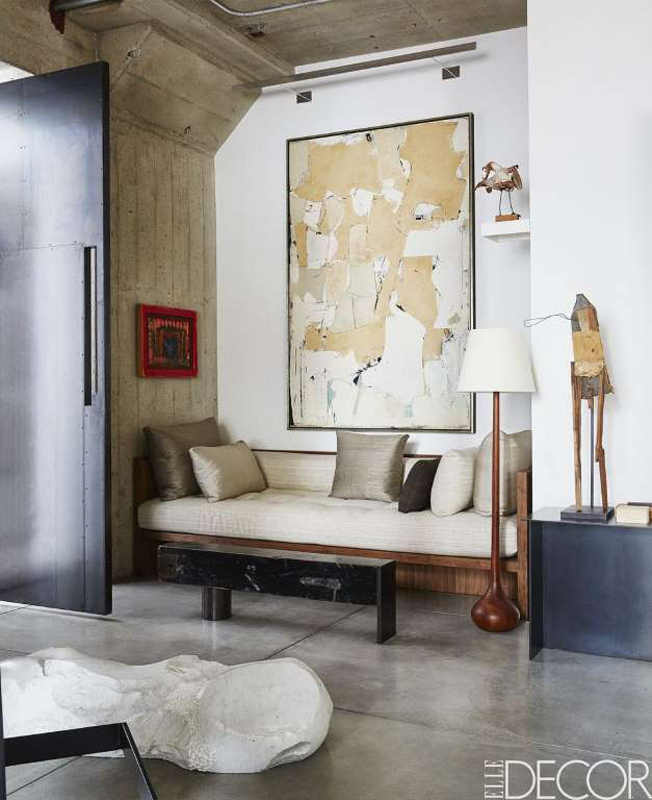 In the smaller living area of a São Paulo home, the sofa was found at a local auction, the Jean Prouvé chair is by Vitra, the hexagonal table and Berber rug are Moroccan, and the walls are painted in a custom color. 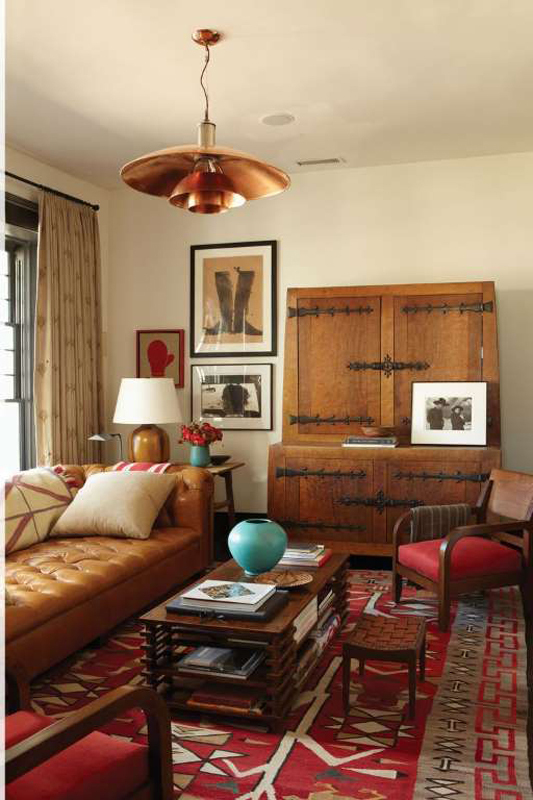 In the living room of Michael Carey's home in Claverack, New York, a George Smith sofa and a corner chair purchased in London are upholstered in an Osborne & Little linen, the Georgian leather library chair and English mahogany coaching table are from Lee Stanton Antiques, the Craftsman armoire is a family heirloom, and the light fixture is by Restoration Hardware. The kilim is from West Elm, and the French faux-bois table and vintage subway signs were found in nearby Hudson. 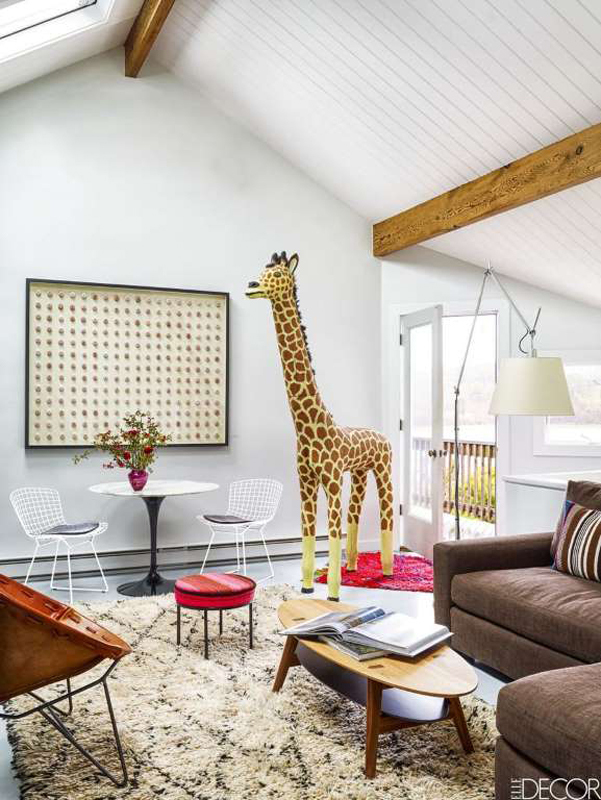 In an eclectic NYC home, the 1940s club chair is covered in a chintz from the same decade, the sofa is by Maison Jansen, and the wallpaper is by Doug & Gene Meyer; the circular rug is by Niba Collections, the carpet is by Holland & Sherry, the cocktail tables are by Fredrikson Stallard, and the central artwork is an Indian sign painting. 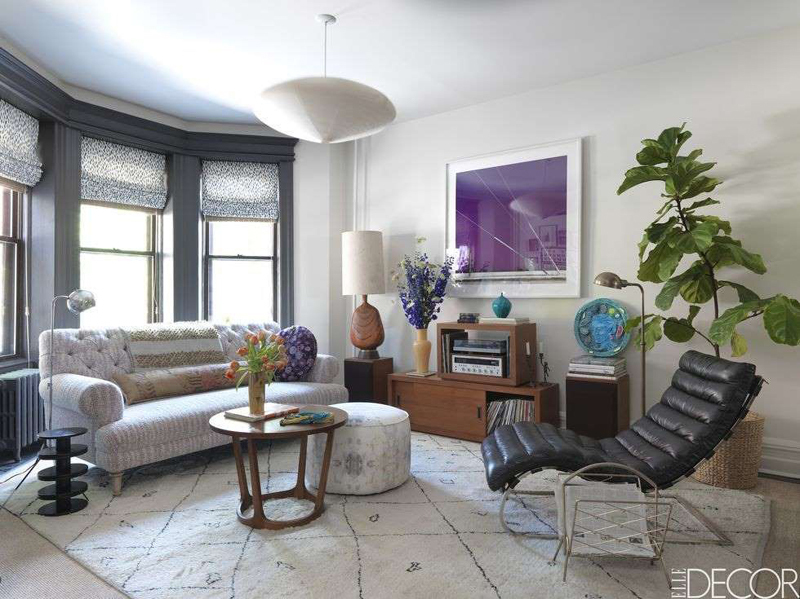 The sofa in the den of this New York apartment is from DDC, the Hans Wegner lounge chair is from Wyeth, and the vintage cocktail table is by Milo Baughman; the painting is by Park Ito and the rug is an early-20th-century Turkish kilim. In the library of a Connecticut cottage, the sofa by Restoration Hardware is covered in a Perennials fabric, the vintage club chairs, upholstered in a Great Plains linen, are from Duane, the cocktail table is Chinese, the circa-1960 chair is by Milo Baughman, and the stool came from the former Manhattan nightclub Moomba; the 18th-century English portrait is a family heirloom, the zebra skin is antique, the blinds are by Hunter Douglas, and the walls are painted in Dragon's Breath by Benjamin Moore. 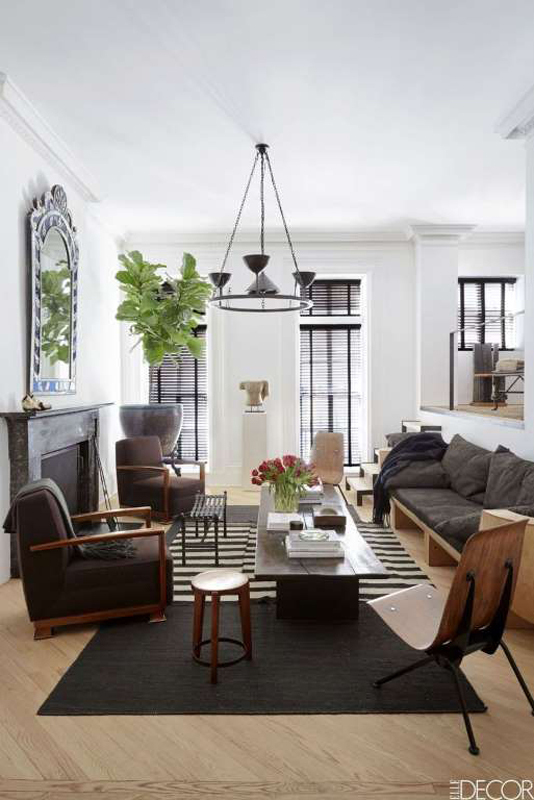 In the West Village pied-à-terre of Los Angeles–based designers Waldo Fernandez and Tommy Clements, the daybed is by Rick Owens, armchairs by Émile-Jacques Ruhlmann are upholstered in an alpaca by Perrine Rousseau, and the side chairs are by Jean Prouvé; the Venetian mirror once belonged to Helena Rubinstein, the 1950s light fixture is by Alberto Giacometti, the sculpture is Cambodian, and the dhurrie and striped kilim are from Lawrence of La Brea. 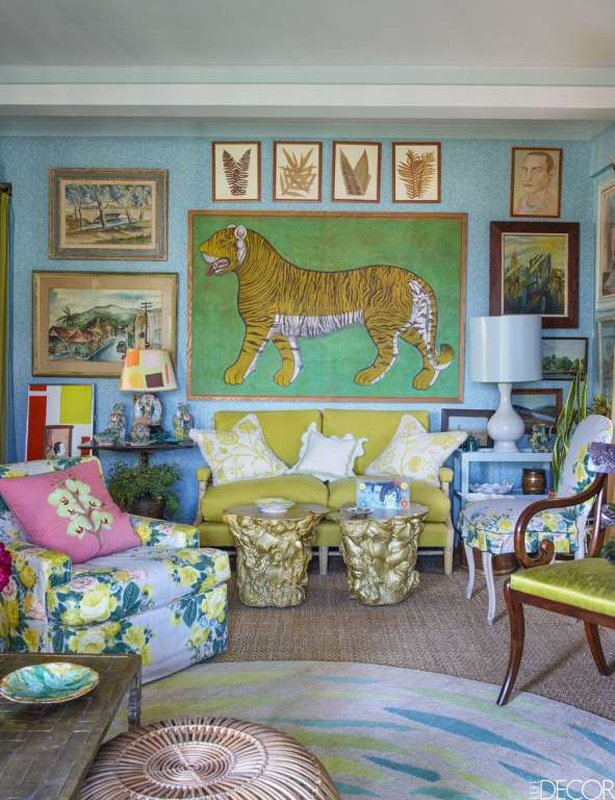 In a colorful Houston home, the walls are painted in Fine Paints of Europe's #WC-48, and the club chairs are covered in a Brunschwig & Fils print. In a modern Pacific Palisades home, the custom sectional is upholstered in a Pindler fabric, the ottomans are covered in a Dualoy leather, and the shades are of a Rogers & Goffigon fabric. 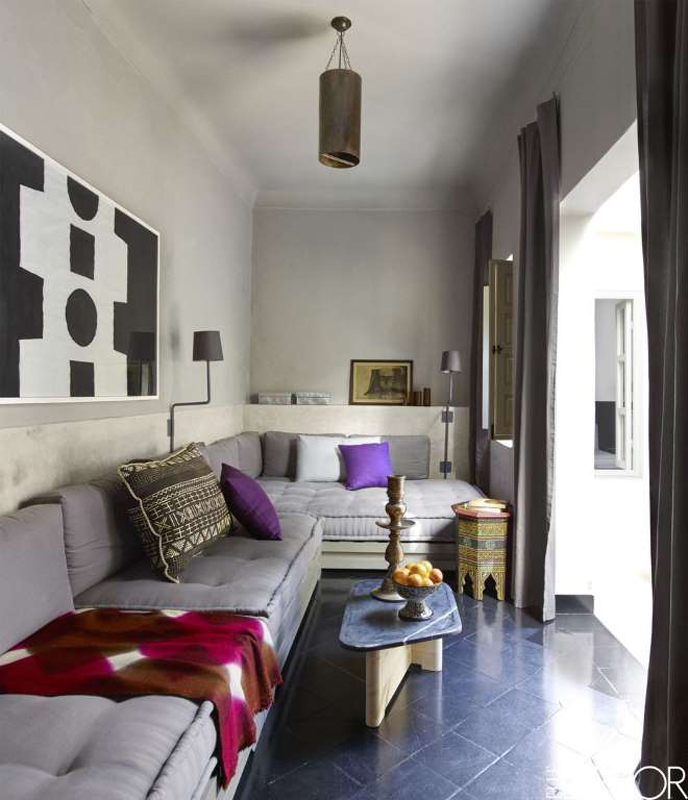 A gouache by McIntosh and a custom-made banquette outfit the sitting area of this Moroccan riad; the cushions's cotton-canvas fabric was found in a souk, as was the painted side table; the pendant and sconces are by maisonLAB, the walls are painted in Farrow & Ball's Lamp Room Gray, and black-painted cement tiles line the floor. 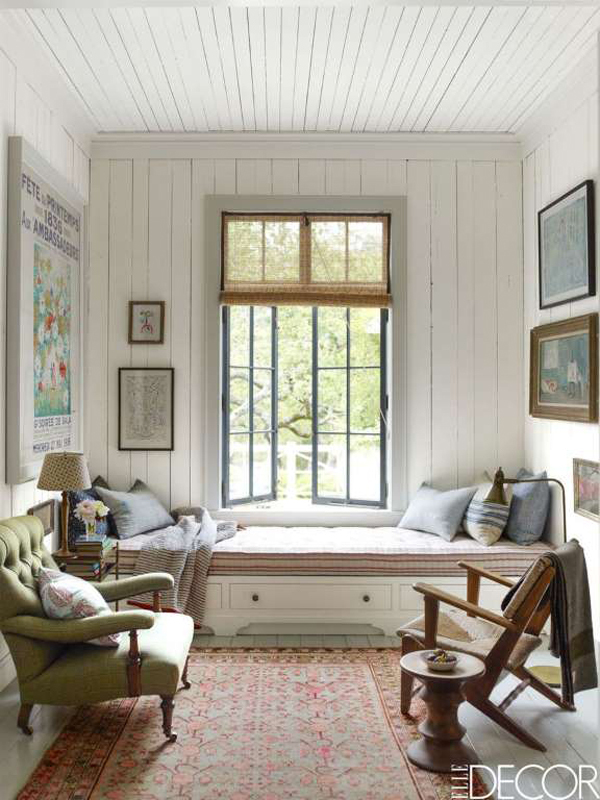 In a California family home, the living room's custom-made daybed by Charles H. Beckley has a cushion covered in a Twill Textiles stripe, the 19th-century armchair, in a Holland & Sherry tweed, is from Alexander von Westenholz, and the floor is painted in Farrow & Ball's Pavilion Gray. The custom-made daybed and Art Deco armchair in the sitting room of this Park Avenue apartment are covered in a Pierre Frey fabric, the 1960s Italian chandelier is from John Salibello, and the carpet is by Stark; the photograph is by Tim Davis, and the print is by Damien Hirst. In a San Francisco townhouse, the family room's 18th-century armoire and midcentury wing chairs are Italian, the sofa is covered in a Great Plains linen, and the side table is Moroccan; the walls and ceiling are paneled in English oak, and the rug is from Stark.